The Scottish Green Party co-convener has set out a list of demands that he said the SNP must meet before his party will support its budget next year. Speaking at the party's autumn conference in Edinburgh, Patrick Harvie called for tax rises for higher earners and tax cuts for lower earners. He also demanded a fully-funded, above inflation public sector pay increase. The SNP is a minority government and needs support from other parties to pass legislation and its annual budget. The Greens are the fourth-largest party at Holyrood, with six MSPs, but the pro-independence party often hold the balance of power in the parliament. Speaking at Edinburgh Napier University, Mr Harvie told party members that tax reform was the "only way" the SNP government could expect Green support for the 2018-19 budget. The MSP reiterated his call for the SNP to drop its policy of cutting tax for the aviation industry and wealthy frequent fliers. He said: "Don't just pause ADT [Airport Departure Tax] cuts. Cancel them. The SNP has no case environmentally, socially, economically. "Even in simple transport terms there are bigger priorities. ADT cuts are now on hold. It's time to scrap the policy altogether. "We also need to see public sector pay rise above inflation and funded because merely scrapping the cap without providing the resources will change nothing, we need local authorities funded to restore lost value, and we need investment in low carbon infrastructure to hit 70% by the end of this parliament." Mr Harvie added: "We can't do any of that without tax reform. Let's cut tax for low earners, and reduce inequality. Greens are clearly leading the change on tax policy. "We have a very clear message for the finance secretary. This is the only way you'll get Green support for the budget." 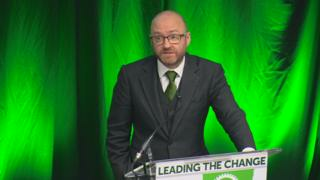 Mr Harvie told party members that the list of Green achievements at Holyrood is "long and getting longer". He added: "We're leading the change on issues from air pollution to rent control, and from the fracking ban to the announcement of a publicly-owned energy company and it's clear that the positive Green agenda we've been pushing for years is making real progress. "With support growing for Green campaigns like our bills to protect children from violence and to make 20mph speed limits the norm, and for core Green ideas like universal basic income and Land Value Tax, it's clear that we have much more progress ahead." On Sunday, Green members backed a motion calling for the "progressive use of newly devolved tax powers, to raise the revenue needed to protect public services and investment". The motion said: "Refusal by the Scottish Government to make further use of the powers available to it is unacceptable". The two-day conference also heard from Sweden's deputy finance minister, Per Bolund, and Green MLA Clare Bailey, who has been leading the campaign to change Northern Ireland's restrictive abortion laws.